We cut, style and take care with love of curly hair in the intimacy of your own home in Brussels and its direct periphery. We celebrate and take loving care of curly hair with products without sulphates, silicones or parabens and teach you to love and understand your hair (we hope for the rest of your life). 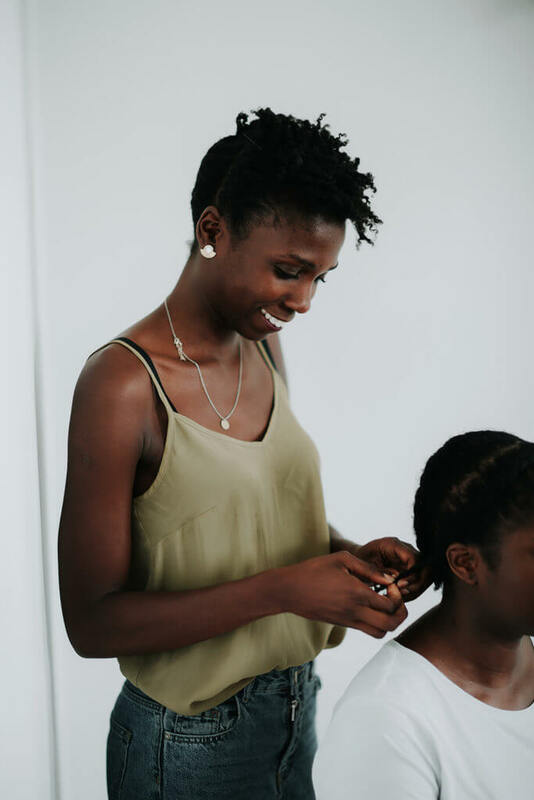 We believe that you are the wonder product for your curls, you just need to follow an easy ritual to get beautiful hair with patience and self-acceptance. From a young age Rosine (or Rose…) was passionnate about hair . In 2006, she decided to stop chemically relaxing her hair and to accept them just as they are. (Read “Open letter to my curls” to learn more about her journey ). After several years in communications and marketing she decided to turn her focus to hairdressing. She was frustrated because there were no accurate information on curls. So she decided to look for more curls education with curls specialists in the Nederland, in UK and in the USA. She has also been trained by Lorraine Massey (the author of Curly girl Handbook) to the Curl by Curl™️ cut. She loves hair, yoga, concerts slow cosmetics, eating, quality time with her family and friends and traveling.